In what was the first ever meeting of these two local rivals at Senior level, it was St Brigids who delivered a master class in finishing to totally outclassed their near neighbours on Saturday afternoon. In front of a large and vocal crowd in Russell Park, it was Brigids who made all of the running from the outset with Collie Carr, Paddy Andrews and Lorcan McCarthy all to the fore. Carr’s brilliantly taken 10th minute goal left the home side 1-02 to no score to the good before two Dessie Carlos frees drew Castleknock’s first scores. Further points from wing-back Collie Freeman and midfielder John O’Loughlin pushed Brigids further clear as the first half drew to a close. Castleknock, who stood an outside chance of making the league semi-finals before throw-in, required goals to spark a second half recovery and last week’s Senior Championship finalists showed such attacking intent with Kevin Kindlon winning an early second half penalty. Wing back Matthew Griffin stepped up to the spot only to see his effort brilliantly saved by St Brigids keeper Stephen Moore. With the game still in the melting pot, Moore’s save was a key moment as Brigids pushed forward to kill the game as a contest soon after. With Neil Collins growing into the game, scores from Seanie Murray, McCarthy and a second Collie Carr goal following a sublime Andrews pass compounded Castleknock misery. 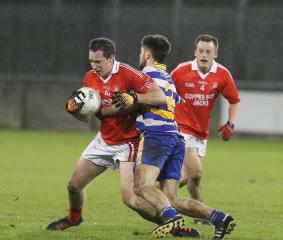 Late scores from Fermanagh man James Sherry and Kindlon was all that a beaten Castleknock offered in reply. At the final whistle, bragging rights for the winter break lie with the Russell Park men as it finished St Brigids 2-18 Castleknock 0-04. Meanwhile in AHL7, St Brigids positive weekend continued as their Junior Hurlers claimed league promotion as they saw off Oliver Plunketts ER 4-08 to 1-09 in their league final. Goals from Dara MacGabhann, Keith Morris, Sean O’Malley and veteran Ciaran O’Reilly saw Brigids over the line despite finishing the game with 14 following the dismissal of wing-back Robbie Keogh after half time.